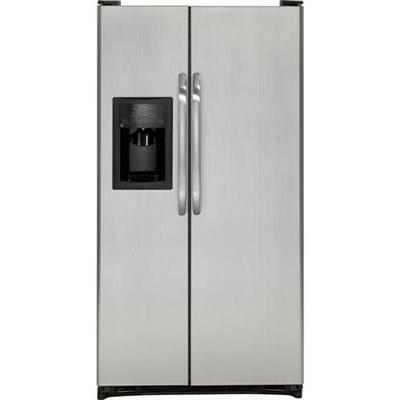 GE® ENERGY STAR® 25.3 cu. 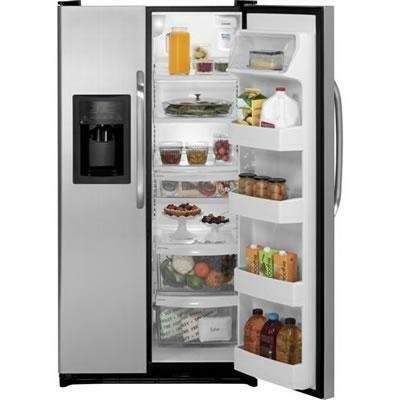 ft. side-by-side refrigerator with dispenser features CleanSteel™ exterior, ClimateGuard System and more. Technologies CleanSteel™ exterior; ClimateGuard System; ADA Compliant; FrostGuard™. Additional Information Temperature Management Features: 3 Electronic Sensors; Control Type: Electronic, External Temperature Controls; Icemaker: Factory-Installed; 3 Fresh Food Cabinet Shelves: Glass, 2 Adjustable, 2 Spill Proof; Fresh Food Door Bins: 4 Total, 2 Adjustable with Gallon Storage; Fresh Food Cabinet Drawers: Multi-Level Drawers, 2-Stack drawer system; Top Drawer: Adjustable Humidity; Bottom Drawer: Adjustable Temperature; Freezer Cabinet Shelves: 4 Wire (1 Adjustable); Freezer Cabinet Shelf Features: Sweet Spot Shelf - 1/2 Fixed; Freezer Door Shelves: 5 Total (Fixed); Freezer Storage Bin: 1 Total (White); Freezer Features: Ice Storage Bin; Leveling System: 2 Point Front Adjustable; Performance Features: Auto Energy Saver, Never Clean Condenser, Easily Removable Door Gaskets. Additional Dimensions Overall Depth	33 5/8 in; Case Depth Without Door: 28 in; Depth with Door Open 90°: 49 3/8 in; Height to Top of Case: 68 3/4 in; Width w/Door Open 90 Degrees Incl. 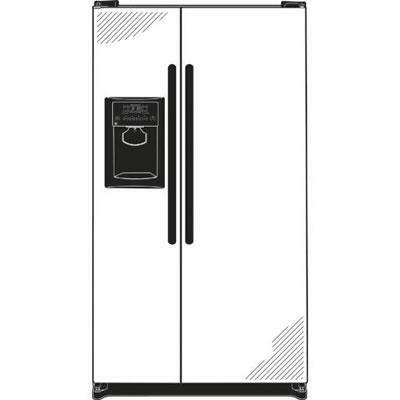 Handle: 38 1/4 in; Width w/Door Open 90 Degrees Less Handle: 35 7/8 in; Back Air Clearances: 2 in; Side Air Clearances: 0 1/8 in; Top Air Clearances: 1 in.